-v. 74, no. 27 (Feb. 25, 1965). Began with Aug. 28, 1891 issue. Description based on: Vol. 11, no. 14 (Dec. 2, 1899). Issues for Apr. 17-24, 1952 not published. 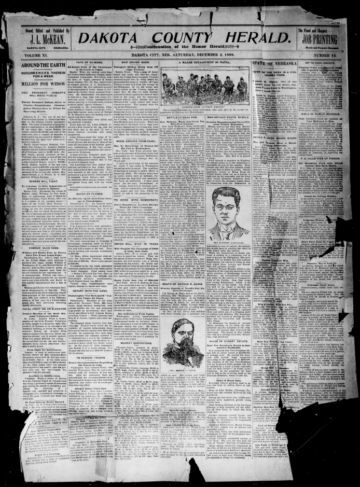 The Dakota County Herald began publication on August 28, 1891, and was initially published by John L. McKean in Dakota City, Nebraska, the county seat. The county was named after the Dakota Sioux tribe, and the city and the newspaper were named for the county. In its early years prior to the establishment of the Herald, Dakota City had been an important Missouri River port and the site of an early land office. It was also the site of the Nebraska Territorial Court—an impressive beginning. This early promise of prominence and industry quickly passed once Nebraska became a state. The court moved to another city, as did the land office. Instead, Dakota City gradually became a suburb of South Sioux City and environs. In the 1890s when the paper began, Dakota City had a population of around 5,400, growing to about 7,700 in 1920. Being situated in the Sioux City, Iowa, metropolitan area, the paper included news from Iowa as well as Nebraska. Much of the early reporting, however, was comprised of stories from exchange newspapers—with national and international news; however, the local news of Homer and Emerson and other small Nebraska towns was featured in the inside pages. Under McKean’s editorship, the Herald described itself as “A Thoroughly Independent Newspaper” and as “the official city newspaper.” Subscription prices in the 1890s were $1.50 per year. In the late 1920s, the flag included the statement “All the News When It Is News.” The Dakota County Herald went through a series of publishers and editors, ceasing in 1965 after having existed for 74 years.